In the far northwestern corner of Wisconsin not far from the shore of Lake Superior, Amnicon Falls is Wisconsin's best kept secret. The terrain of the park is rocky, with a Basalt surface over the top half of the park, and Sandstone below. The reason for this is an earthquake many centuries ago. 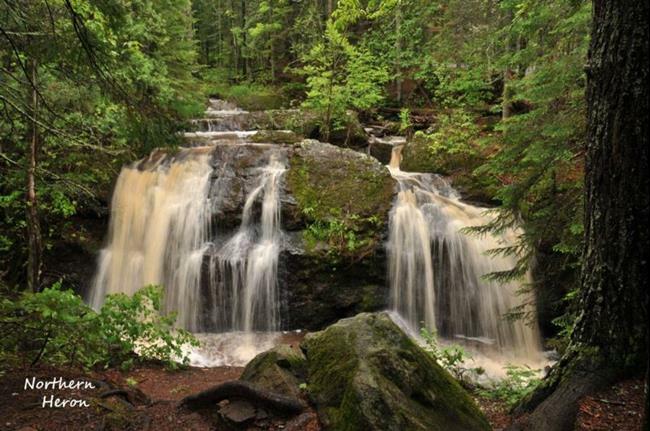 The Amnicon river winds it's way to Lake Superior through the park with a series of waterfalls that surrounds a small evergreen laden forest with walking trails. The park is chock full of evergreens growing right out of the Basalt and shale sandstone rock, and a few stragglers of other hearty species of trees, but mostly it is the evergreens that thrive in the harshest of conditions. The falls in this picture are my favorite in the park, aptly named Now & Then Falls, as unless it is Spring, or after a heavy Summer rain, or during Fall rainy season, there is not always water to be found here. I especially love how any picture you take of this pair of Falls is beautifully framed by the lovely evergreens. The few tourists who do find their way to Amnicon Falls State Park rarely see this lovely spot, as it is tucked away in a corner away from most of the rest of the park. The word Amnicon means "where fish spawn"